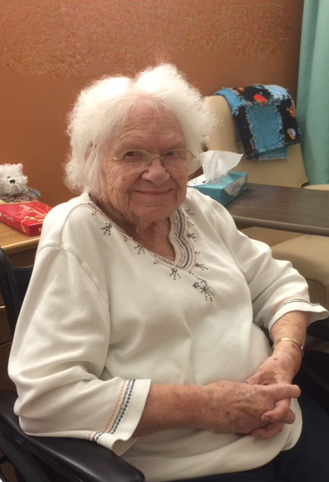 Florence Wold Widstrand, age 98 of Hibbing, died Sunday, March 17, 2019 in Guardian Angels Health and rehabilitation Center in Hibbing. She was born August 17, 1920 in Hibbing the daughter of Gust and Olga (Aho) Wold. Florence graduated from Grand Rapids High School and Hibbing Junior College with a degree in Home Economics. She married William W. “Bill” Widstrand on March 25, 1939 and was a longtime Hibbing resident. Florence was an active member of First Presbyterian Church in Hibbing where she taught Sunday school and was the Sunday School Superintendent. She was a 4-H Club Leader, a Girl Scout Leader, a Past Noble Grand in the Rebekah Lodge, and Past Worthy Matron of Mesaba Lodge #211 Order of the Eastern Star. Florence is survived by children: Rolf Widstrand of Aurora and Betty Widstrand of Champlin; grandchildren: Ellen Widstrand of Moorhead, Gretchen Gutierrez of Champlin, and Michael (Priscilla) Wojcik of Maple Grove; great-grandchildren: William Montnegro and Julian Gutierrez; nieces, nephews, extended family and friends. She was preceded in death by her parents; husband Bill; Son: William “Woody”; daughter-in-law: Beverly Widstrand; siblings: Donald Wold, Margaret Johnson, and Kaye Christofferson. The memorial service will be held at 1:00 p.m. on Saturday, March 23, 2019 in First Presbyterian Church in Hibbing. Pastor Katie Larson will officiate. A gathering time for family and friends will begin one hour prior to the service at the church. Inurnment will take place at a later date in the Hibbing Park – Maple Hill Cemetery. Family services provided by Anderson-Daniels, A Bauman Family Funeral Home in Hibbing. To share condolences online, please see: www.baumanfuneralhome.com .